Developers at Cityscape Global 2018 are riding on various incentives targeted at both buyers and brokers to sell their existing inventories. This takes the form of extended post-completion payment plans, Dubai Land Department (DLD) registration fee waiver, guaranteed rental returns, exit options for distressed buyers, free service charges for extended periods and more. Although these were prevalent at last year’s edition of Cityscape as well, what’s different this year is that developers are offering discounts on sales prices to buyers and higher commissions to brokers. While the industry norm is two per cent of the sales price, developers are now offering between five to 10 per cent as a commission to incentivise brokers to sell their properties. Azizi Properties is offering these incentives for its projects on the Palm Jumeirah, Healthcare City and Al Furjan. At Azizi Aliyah Residences in Dubai Healthcare City, there is a zero DLD fee, one year free service charge and a 20:80 payment plan, with prices for a one-bedroom apartment starting from Dh1.5 million. For all its properties in Al Furjan, Azizi is offering reduced service charges, a 10:90 payment plan and zero DLD fee, with the price for a one-bed apartment starting from Dh820,000. At Azizi Mina on the Palm Jumeirah, the developer is offering 50 per cent off the DLD fee, a 20:80 payment plan, with the price for a one-bedroom apartment starting from Dh2.6 million. These are all Cityscape-exclusive offers. “We have launched Fawad Azizi, a 17-storey building with around 450 apartments, in Healthcare City. We have more than 26 buildings under construction at our flagship project, Azizi Riviera. We will hand over 2,000 units this year: five projects in Al Furjan, one on the Palm Jumeirah and one in Healthcare City,” Mirwais Azizi, chairman and owner of Azizi Group, told Khaleej Times. Meanwhile, Danube Properties has announced offers on both ready properties and off-plan apartments. The group is offering two to six per cent discount on off-plan properties and four per cent brokerage commission as well as a 25/75 payment plan on ready-to-move-in homes. The buyer pays 25 per cent upfront, starts living in the home and pays the remaining 75 per cent at the rate of 0.75 per cent for 100 months. “We are launching special discounts for buyers to benefit from the lower price at Cityscape Global. In this Cityscape, our team will focus on selling off the 250 properties that are yet to be sold,” said Rizwan Sajan, founder chairman of Danube Group. However, not all are in favour of these excessive incentives. Some of the industry stakeholders have issued a caveat about the unsustainable nature of these incentives in the long term. “These post-completion payment plans have lost their uniqueness. When they first came out, it was encouraging a lot of buyers to use developer financing to purchase a property. But now you are seeing everyone from Emaar through to the secondary developers offering these plans. 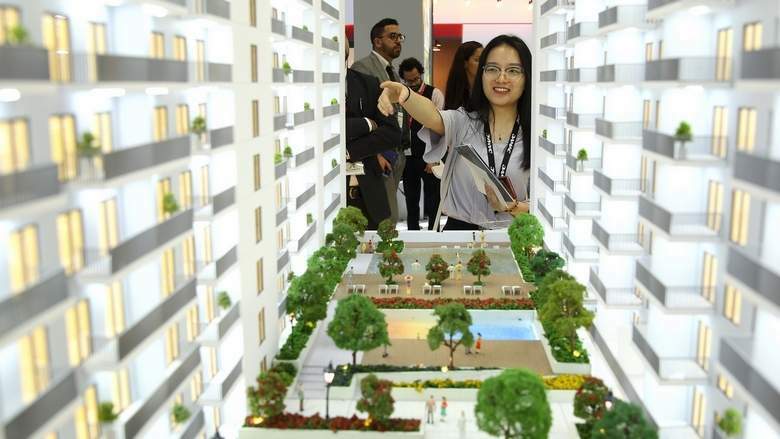 Now, these are something that a buyer will automatically expect when buying property. The old payment plans are now obsolete,” remarked John Stevens, managing director, Asteco. Damac Properties is offering apartments starting from Dh399,000 at its newly launched Fiora tower in Golf Verde, Damac Hills. The luxury developer is also offering a two-year post-completion payment plan (40 per cent payment up to handover), a 10-year waiver of service charges and a DLD fee waiver. This is, however, being offered on a project-by-project basis only. “We don’t subscribe to the idea of extended post-completion payment plans. We don’t need to take that risk. It’s not conducive for a healthy market in the long run. There will be defaulters and it will affect banks’ balance sheets and the sector’s reputation. That’s not a strategy we want to adopt at this stage,” Wael Al-Lawati, senior vice-president, international development, Damac Properties, told Khaleej Times at Cityscape. He added that investors mostly seek incentives in the form of guaranteed net rental returns. “For instance, in our Radisson Hotel, Dubai Damac Hills, we are offering guaranteed six per cent returns over three years and annual tickets for overeas investors,” Al-Lawati added. Meanwhile, Sun and Sand Developers is offering an ‘exit option’ for buyers at its new project, Suncity Homes in International City. The exit option will allow buyers in genuine difficulty to make use of every cent paid towards their purchased unit through either: (1) a rent-free plan for a maximum of three years, or (2) a cash-back plan from the apartment’s rental income. Buyers at MAF Communities’ Al Zahia community in Sharjah can benefit from Sharjah’s first post-handover payment plan, guaranteed returns of 18 per cent during construction and homes that start from Dh935 monthly.